This estate claims it's been around for three centuries in what was called the Ribatejo region...these days it's called the Tejo region. 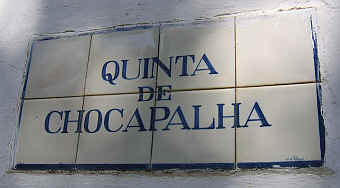 We know it as Quinta da Lapa but its full name is "Quinta da Conceicao de Lapa" which is a real mouthful. They say the original building was constructed in the 1750s after a major earthquake. These days Silvia Canas de Costa owns the place. Her father bought the place in 1986, if we understand the history correctly. Silvia trained as an architect and that training came in handy as she remodeled the place and now, in addition to a winery, there's a small "hotel" of sorts. Her "husband" is a prominent chef in Lisbon and his influence is felt if you stay there and arrange a meal. You'll need about an hour in the car and you'd be driving north of Lisbon to get there. The estate comprises about a hundred hectares with about 67 of them planted with grapevines. You'll find traditional varieties here and some international grapes, as well. We've taken a fancy to the wine they call "Nana" after Silvia's Mom. Nana wasn't Mom's name, but that's what everyone called her, so she's honored by being on the label of a nice blended red. Touriga Nacional is blended with Aragon�s and Trincadeira Preta. This was matured in both French and American oak cooperage. There's a mildly woodsy tone to the wine. Medium-bodied. Not much tannin. The name Graham's is probably familiar to you if you're a fan of Portuguese wines. The Port firm of Graham's is an elite producer of top quality Ports and it's owned and operated by the Symington family. You can imagine the Symington's must have been surprised when they found wine on the market with the "Churchill Graham's" name. It seems Johnny Graham and his wife, Caroline Churchill thought of using both names on bottles of Port wines. Of the course, the Symingtons pointed out that they bought the Graham name, so these days you'll find the "Churchill's" brand to be prominent, as Johnny G. has to work in the shadows, if you will. Johnny worked for Cockburn's for some years, getting his feet 'wet' and this had a major impact on his winemaking philosophy. He's a big fan of foot treading the grapes, by the way, at least for their Port wines. 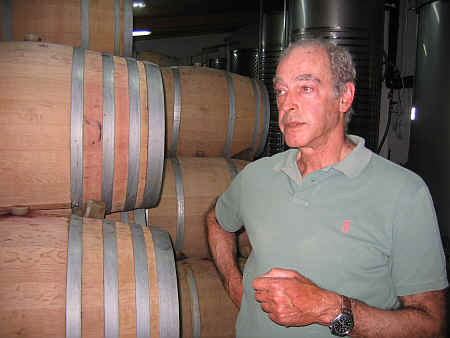 Following some years at Cockburn's, Graham then was a consultant for Taylor Fladgate before hooking up with vineyard owner Jorges Borges de Sousa in 1981 and making his own wine under his own banner. Now Graham is producing table wine, a fashionable endeavor these days in Portugal's "Napa Valley." Table wine in "Port Country" is all the rage with every serious winemaker these days and many of them are not shy about pricing their wines. The Douro has all kinds of interesting grape varieties and we found Churchill's blended red to be of particular interest. We purchased a bottle of their Estates Douro from 2008 and a much more costly bottle of Touriga Nacional. Less interesting to us, anyway, was the far more costly bottle of Touriga Nacional. That wine was matured entirely in French oak and it struck us more as the sort of wine made to appeal to wine critics who are not drinking the wine but merely "tasting" it to give it a numerical score. We found it to have all the requisite features: Dark color, powerful aromas, moderately oaky, full-on attack, tannin, robust, full-bodied...but we didn't find it worthy of a re-pour. Your mileage may vary, of course, but for relatively small money, we'll go with the $18 Estates Douro! From the town of Estremoz in the Alentejo you'll find a remarkable property which, in the middle of the 18th century, had been a gift from King Joao The Fifth to a girlfriend, Dona Maria. The property was called, for many years, the Quinta do Carmo and the present owner of the Dona Maria estate, Julio Tassara de Bastos (that's his "JB" in the logo above), had sold half of the Quinta do Carmo property to the Rothschilds of Chateau Lafite back in the 1990s and they built another winery at a different location. Now the Quinta do Carmo name is owned by someone else as a wine brand and JB uses the name Dona Maria for his wine. To get your bearings as to the location of this lovely estate, from Lisbon you're heading south of the city towards Palmela and the Setubal area, continuing on the A-6 in the general direction of Evora, but driving north to Estremoz. Depending upon traffic, you'd be there in less than two hours. 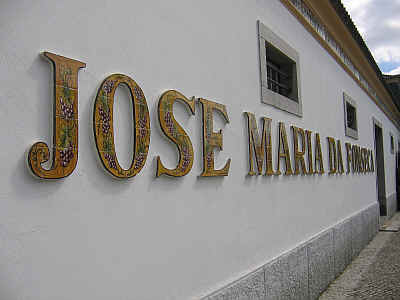 In 2002 JB bought a neighboring vineyard and in 2003 they made their first Dona Maria wines. We tasted a rather upscale bottling, a Reserva which is truly worthy of the 'reserve' designation. It's from the 2004 vintage and the wine is an interesting blend: 50% Alicante Bouschet (a grape producing inky, intensely-colored wine), Tempranillo, Syrah and Cabernet. The wine is matured in French oak, but with as much time in the bottle as this has had, the wood is now nicely integrated with the wine. It's a medium-full to full bodied red wine and one to pair with grilled or roasted red meats especially. The Crasto estate is a beautiful property on the north side of the Douro on a hill situated between R�gua and Pinh�o. The property currently consists of 230 hectares (not all planted to vineyards), with some very old vines in some of the vineyards. The name Crasto probably stems from the Roman word "Crastum," meaning "fort" or "fortress." The estate is owned by the Roquette family, a major wine clan in the realm of high quality Portuguese wines. 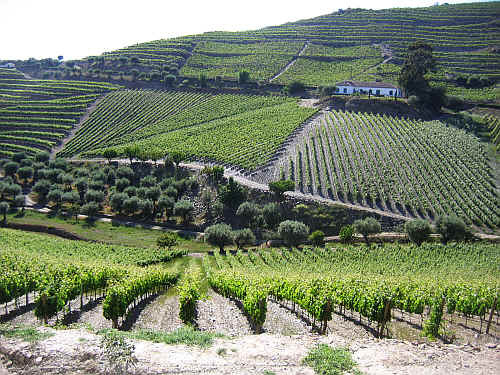 Another branch of Roquette's owns the famous Herdade de Espor�o property in the Alentejo region. Tomas and Miguel run the enterprise. It was their grandfather who bought the place in the early 20th century and it was, apparently, a vacation home for many years. When the brothers got involved in their own wine estate, they turned to their cousins in the Alentejo who had their winemaker, Australian David Baverstock, head up to the Douro to offer consulting and winemaking advice. The winery has grown dramatically over the past decade and today it's one of the leading lights in the Douro. 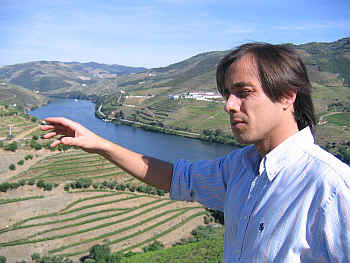 Manuel Lobo de Vasconcellos is the winemaker. The entire winery was in a state of change when we visited in the Spring of 2009. One whole cellar will be devoted entirely to the production of white wine. Another cellar will be devoted to Port, though only seven percent of their production is in Port wine. They use a lot of French oak for their table wines, some of which are stellar. We find the wines of Crasto to be generally quite impressive. Their basic red wine is of good quality and retains its sense of place nicely. Some tasters may find the Old Vines bottling of red and the Touriga bottling to be "too internationally-styled," but we find these to be exceptional wines on any level. The youthful and exuberant 2011 Douro red is a delight. The wine is vinified to highlight the red and black fruits in this wine. It's a blend of Tinta Roriz, Tinta Barroca, Touriga Franca and Touriga Nacional...most of the wine sees only stainless steel and a mere 5% is put into wood. It's a medium-full red wine in terms of body and lightly tannic. Pairing it with food softens the wine. We like it served at cool cellar temp...It's balanced enough to pair with roasted chicken and deep enough to accompany a steak. Ports are quite good, as Manuel explained they make Port as a "fortified, sweet red wine. We don't make it from over-ripe grapes." It's also less sweet than many of the more famous brands of Port. This is a huge company, producing more than a million cases of wine annually. Their portfolio includes more than two dozen wines, not to mention brandy and sparkling wines. The firm is now run the by sixth generation of the family, they manage to combine tradition with modern winemaking. They are not affiliated, by the way, with the Port producer in the Douro Valley which also bears the Fonseca name. One of the two brothers runs the business, while the other (a U.C. Davis graduate) is in charge of the winemaking. It was founded in 1834 by Jose Maria, a fellow who brought the Castel�o grape to the Terras do Sado (they're in the town of Azeit�o, about a 30 minute drive south of Lisbon) from the Ribatejo region (north of Lisbon). Castel�o is the table wine backbone of the house. The winery has, in fact, been a victim of its own success. They've long sold a simple, good quality red table wine made from Castel�o using the name "Periquita." Other winemakers started calling their Castel�o wines "Periquita." After much legal wrangling, it's been decided that Periquita is really a brand name and it's exclusive to Jose Maria da Fonseca, so others have had to change the name of their wines back to Castel�o. The current Periquita wine is a nice, simple, straightforward, reliable red. It's not a fancy, oaky red wine. It's not made with American wine critics in mind. They seem to make this for people who are willing to pay ten bucks for a decent, well-made bottle of wine. 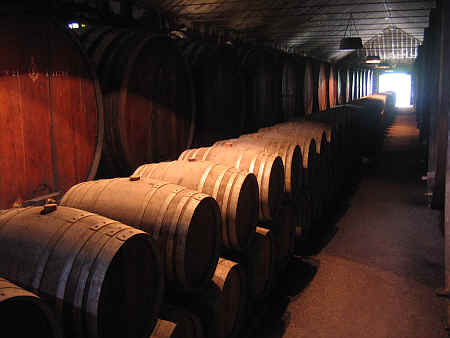 The Periquita wine spends a few months in mahogany vats and a small percentage of the blend goes into oak. Those big casks are the ones made of mahogany. They typically now blend in a small amount (maybe 10% each) of Aragonez and Trincadeira into their Periquita wine. They make a Periquita "Reserva" wine. This was, at one point, simply the normal bottling of Periquita with additional bottle aging. It also used to be called "Classico." Today, though, the wine is actually more of a special selection. It's typically a blend of half Periquita with some Touriga Franca and Touriga Nacional. The Touriga vineyards are mature, having been planted in the 1970s. JM da Fonseca also makes a wine called Domini which has no Periquita. This was, initially, made in collaboration with their (and everybody's, it seems) cousin, Cristiano Van Zeller of Douro acclaim and fame. Domini today is made of Touriga Nacional, Touriga Franca and Tinta Roriz. The other major claim to fame by this winery is the famous Moscatels called Set�bal. Back in the 1970s and early 1980s, every wine emporium in the Bay Area had some bottles of these. But as the popularity and novelty of drinking one of the world's great dessert wines waned, demand for this tapered off. The various companies importing the JM da Fonseca wines left this off their price lists. We asked some importers to get this for us and we've long had two different bottlings of 20 Year Set�bal in the shop. And now the main importer for their wines is bringing in the Alambre 2010 vintage...lots of ripe pear and caramel notes to this beautiful sweet wine. You can add a cup of this to the water when poaching pears and then serve the rest of the bottle, lightly chilled, with the pears. It's aged in neutral wood for a few years and this gives a faint note of oxidation to the wine. They have a remarkable cellar full of Set�bal wines. 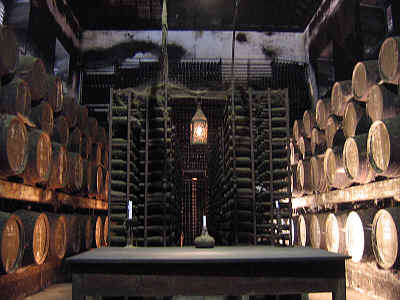 The photo above shows barrels of very old Moscatels. It's got to be difficult for producers such as the Caves de Cerca who make this Famega wine. Here they are, in an era when every wine has to "make a statement." 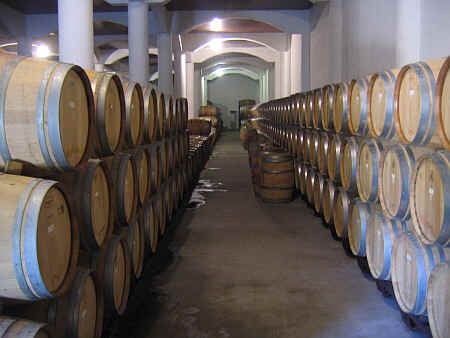 Many wines, even the whites, are 15% alcohol and loaded with oak. Yet they continue to produce this light, simple, modestly-priced, dry and faintly fizzy little wine in an age when people seem to be looking to be whacked over the head with potent wines. No oak, of course. Low alcohol. Slightly fizzy. This is a delicious wine with steamed clams, especially. But it makes for a nice little picnic white, too. 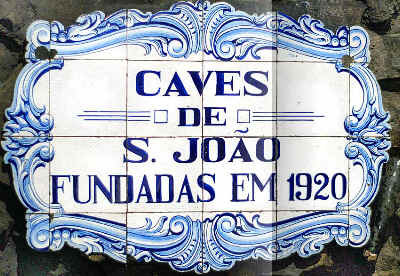 The Caves Sao Joao is a producer whose wines have been in and out of the Bay Area market since the 1970s, maybe even before. I recall having some of their wine in the shop way back when...and they've never really be consistently available. 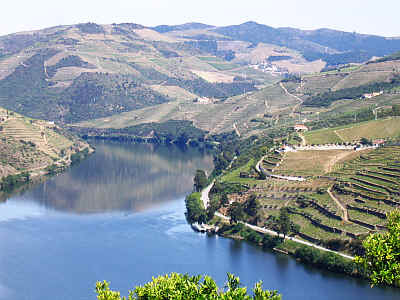 It's a family-operated company, with wineries in a few areas of Portugal, having started, we understand, in the Douro. Today, though, the wines arriving here hail from the Dao and Bairrada regions. 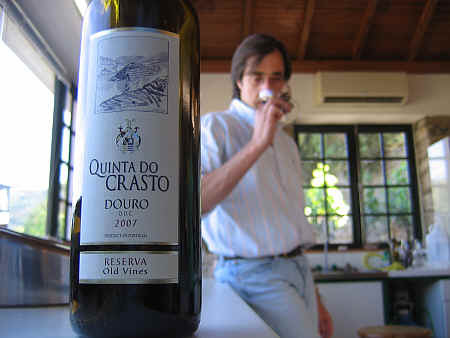 We tasted a few things recently and liked a 2010 vintage Dao of their Porta dos Cavaleiros label. It's a medium-full bodied red wine made of 40% Touriga Nacional, 30% Alfrocheiro and 30% Aragones. We like the mildly cedary bouquet of this well-priced red. It's got a nicely woodsy element and some brown spice tones. With a touch of tannin, this is a terrific bottle to pair with lamb or beef. 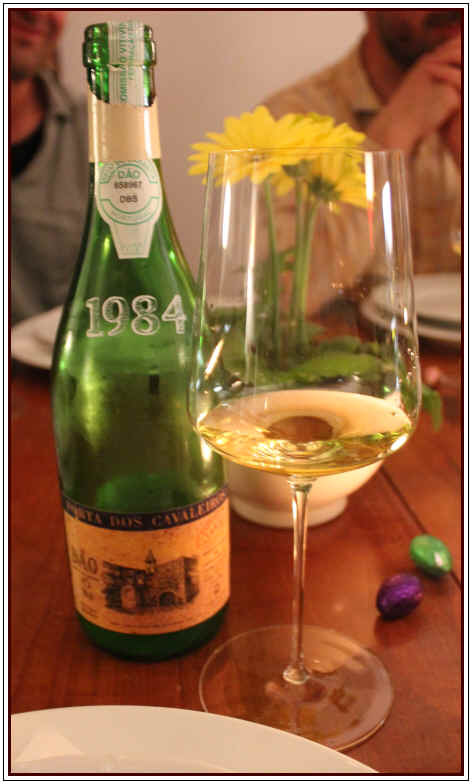 At dinner in France in March of 2016 we enjoyed an impressive bottle of their 1984 vintage white wine. I'd never have imagined such a wine could age so magnificently. Muito Obrigado to the lovely Portuguese folks who provided this bottle! Now being operated by the fourth generation of the family, the Ermelinda Freitas winery is located in Fernando P� (that's the name of the town, named after a 15th century navigator who discovered the islands in the Gulf of Guinea, west of Cameroon and Gabon). This town is south and east of Lisbon in the Palmela region. The company cultivates all sorts of varieties amongst their 240 hectares of vineyard. Castel�o accounts for 75% of the plantings, but they also grow Touriga Nacional, Trincadeira, Syrah, Aragon�s, Alicante Bouschet, Touriga Franca, Merlot and Petit Verdot amongst the reds and white varieties such as Fern�o Pires, Chardonnay, Arinto, Verdelho, Sauvignon Blanc and Moscatel de Set�bal. We tasted a rather nice red wine from this company, a wine from the 2011 vintage which is made entirely of Castel�o. The vineyards are mature, averaging about 50 years of age. The wine is medium-bodied and fairly smooth, with some of the wine being aged in French oak. We like the dark fruit notes and mildly cedary, woodsy notes present in this showy little number. Were this to come from California, we'd see a price tag on the bottle of something like $20-$30, but since it comes from a place where they make wine to drink, rather than to put in a display case to admire, this carries a modest number: $13.99. And worth every penny! A husband & wife team produce the Wine & Soul offerings from Portugal's Douro Valley. Jorge Ser�dio Borges has been affiliated with the great Dirk Niepoort of the Niepoort winery (and assorted table wines and Ports), while Sandra Tavares da Silva works for Cristiano Van Zeller at the Quinta do Vale Do�a Maria, making Port and table wine. The couple launched their own company called Wine & Soul with a vineyard in the Vale de Mendiz at Pinh�o. The vineyard is quite old and it's a mixed planting of perhaps as many as 30 different varieties. They make a tiny bit of white wine called Guru, two red table wines and a Port. We tasted their Pintas "Character" from the 2014 vintage...vines are approximately 45 years of age and the wine is thought to be predominantly Touriga Nacional, Touriga France and Tinto Roriz, plus whatever scattered oddball varieties are also in the vineyard. 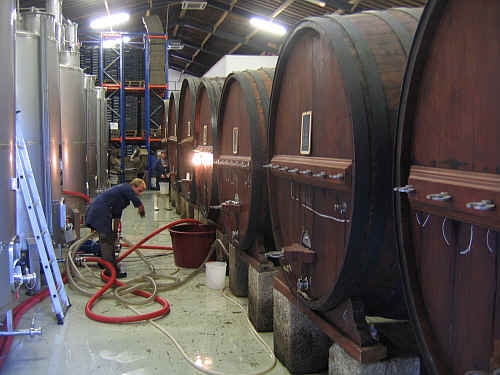 The wine spends about a year and a half in small French oak barrels, 50% of them being brand new. The 2014 is beautifully intense, showing a nice black fruit aroma with mildly woodsy fragrances. It's fairly full on the palate, being dry, robust and nicely oaked...serve this with Cabernet Cuisine...steaks, grilled or roasted red meats, etc. It's quite showy now and should be fine for another 5 or 10 years. The Chocapalha estate is a smallish family estate northeast of Lisbon. You'll need maybe 40 minutes to get there from the Portuguese capital. It's owned by Alice and Paulo Tavares de Silva, whose daughter is a rock star winemaker in the Douro Valley. The property presently encompasses about 45 hectares of vineyards and Sandra Tavares oversees the winemaking. The place is reasonably modern and they use traditional lagares for fermenting their red wines, but employ mechanical treaders instead of having friends and neighbors dancing barefoot or wearing rubber boots in these fermenters to breakdown the grapes and keep the skins in contact with the juice. We have their 2013 Castel�o in the shop. This was fermented for about 10 days on the skins to dryness before being transferred into small French oak barrels as those you see in the photo above. It spent about a year in wood and the wine has the body of a Pinot Noir or a robust Gamay, for example. It displays bright red fruit fragrances and flavors. Oak is not a major component of this. We find it to be dry and fairly smooth and it tastes even better with food. The wine is not intended for extended cellaring, so you'll want to put it on the dinner table in the next year, two or three. 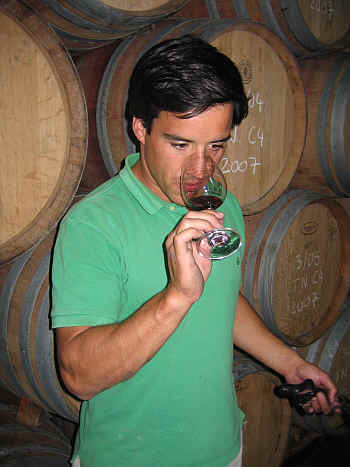 Enologist Diego Sep�lveda back in 2009. By the way...we also have Sagres Beer from Portugal, as well as some brandies and liqueurs.